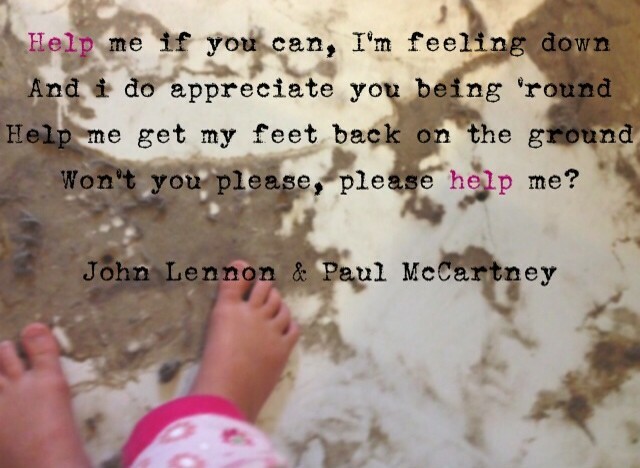 Home » Kin Blog » 2014 October: Mindful » Please help me! Satisfied, he goes on with his day, but his words linger in the kitchen, and hang in my heart. Why does his question unsettle me so? Am I unwilling to admit my own fragility? Have I forgotten I am but dust and need the one whose strength never fails? I am driven to my knees (again) as I confess I have walked in solitude. I bow my head, not in shame, but in acceptance that weakness is a necessary part of my humanity. I don’t think we need to be a mum to know that we are breakable, to accept that weakness is part of our humanity, or to be willing to reach out for help. Weakness, at least here in Australia, is not something we admit to often, however. I don’t often find myself saying anything remotely close to “I’m not coping, I need help” – at least not out loud. In fact, my coping mechanism tends to be to withdraw, to shut out the ones who might notice I’m not at my best, have a cry or two and ‘just cope’. Yet I’ve been challenged this last week. My week had been tiring and I’d hit a wall. The whole family (including myself) had been sick with a nasty bug that was proving hard to shake. The house was chaotic and in terrible need of a clean and my to-do list was a mile long. We were drowning in pages and pages of school papers and junk mail, and the study had been gradually building up to qualify for hoarder status. Dinners were increasingly boring and completely lacking in good planning or nutrition. Washing – both clean and dirty – was piling in multiple corners of the house. I was getting dubious, but desperately emotional pleas of “please don’t make me go to school mum, I have a tummy ache”. Sibling rivalry was at its best, I was grumpy and tensions were rising. Not anything earth shattering, but overwhelming and all-consuming just the same. I’d missed a call from my mother-in-law and I’d not yet returned it, yet I found myself unable to pick up the phone. My emotional fragility was just a little too raw. I knew without doubt I would end up a blubbering mess. As I sat on my kitchen floor I had to make a choice. I could sit there and feel sorry for myself and be no good to anyone, or I could do more than pay lip service to ‘vulnerability and authenticity’ and call out for help! I didn’t make the phone call, but I did dig deep enough to find the courage to send a text. I’m glad I sent the text. Initially I felt a little embarrassed, even guilty, at the supportive, loving, encouraging reply and the offer of practical help I received, but gosh it was the best thing I could have done. Why is it so hard to accept that weakness is a normal part of being? Why is it so hard to accept that we need help? Why does our stubbornness reduce us to ‘just coping’ because we want to be seen as independent, amazing, superwomen who have it all together? Why can’t we see that even superwomen need help sometimes? Just tonight, I was reminded very practically about what happens when we think we can do it on our own. One of my daughters was climbing and had managed to get fairly high up. As she tentatively clambered her way down, she called out to me, “I don’t need help mum!” The words had hardly left her mouth when she lost her footing and slipped rather painfully to the bottom. There is true courage in having a go and in being brave, and there is victory in succeeding. But there is no less courage in asking for help and certainly no less victory in succeeding together. I love the idea of ‘I can do it myself’ —the cry of the two year old. We can carry that with us into adulthood to our detriment. Thanks for sharing your story. It may seem ordinary, but I’m sure many will be inspired by your honesty and perspective.